Upupa alaudipes Desfontaines, 1789, between Gafsa and Tozzer, Tunisia. 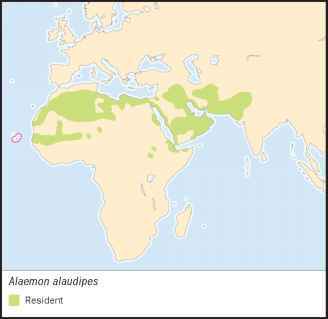 English: Hoopoe lark, bifasciated lark; French: Sirli du désert; German: Wustenlauferlerche; Spanish: Alondra Ibis. smaller than males. Bill very long, slender, and slightly de-curved. Plumage sand-colored above, underside white, throat and breast with dark spots, similar in both sexes. Wings long and broad with conspicuous black-and-white pattern, comparable to that of African subspecies of hoopoe (Upupa epops). This lark was first described as a hoopoe, and its original scientific name means "hoopoe with legs of a lark." Cape Verde Islands, North Africa from Mauritania to Egypt and Sudan, across the Middle East to northwestern India. Tame and confiding, allowing humans to approach to within a few feet. Male defends territory against conspecific intruders and other birds by wing-spread behavior. Usually solitary or in pairs. Song ringing and far-carrying. For song-flight, male jumps up from perch and starts to sing, ascending almost vertically up to 33 ft (10 m) and performs somersaults, displaying its contrasting pattern on tail and wings. It then closes its wings, nose-dives back to perch, not opening its wings until landing. Song-flights can be repeated frequently within up to one hour. Mainly arthropods and snails. Most food items obtained by digging with bill. Female bill is 30% shorter than bill of male, so sexes probably exploit different food resources. Two methods for cracking snail shells: snails dropped onto stone in flight or smashed against stones directly until shells break. Monogamous. Only lark species building nests frequently on top of low shrubs, up to 24 in (60 cm) above ground. Also building cup-shaped nests on ground. Two to four eggs incubated by female for about 14 days. 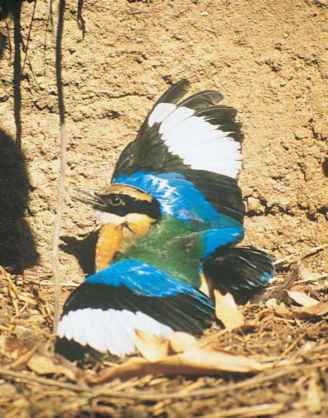 Both parents feed young, which leave nest after 12-13 days, before being able to fly. Young remain for at least one month with parents.